Fast, accurate bridge saddle adjustment. 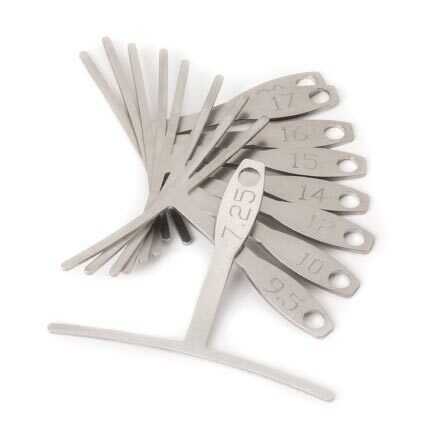 Each of these unique gauges has an accurately radiused arc on both the top and bottom surfaces, and is shaped to fit easily under the strings. Use the bottom curvature to determine your fretboard radius, and the matching top curvature becomes a reference for setting string saddle heights for best playability. Low profile fits tight spots. The slim shape of our understring gauges allow you to read the fretboard radius even with the strings on! This is also handy for matching pickup polepiece heights to the arc of the strings. And setting bridge saddles is easier than ever. 7-1/4", 9-1/2", 10", 12", 14", 15", 16", 17" and 20" radius. This product was added to our catalog on Thursday 21 February, 2019.